In this week’s episode of This Old Marketing, Robert and I explain why Time Inc.’s recent purchase of the company that owns Myspace has little to do with the once-thriving social networking site – and what was really behind it. Next, we discuss Twitter’s new “catch-up feed” rollout and what it means to users and advertisers, and new research that indicates content is growing fast, but engagement is dropping. Finally, we ponder an article that suggests that the tech sector is in for a big slowdown and interpret what that means to marketing tech and ad tech firms. Rants and raves include Frank Underwood’s faux campaign headquarters, out-of-this-world “space tourism” posters, and the macroeconomics of native advertising. We wrap up the show with a This Old Marketing example from Fat, Sick and Nearly Dead. Myspace and its owner acquired by Time (5:47): Time Inc. has announced that it has acquired Viant, a profitable company that has built a large ad tech business, but also owns other properties, including once-hot social networking site Myspace. I’m confident this deal had nothing to do with Myspace and everything to do with the ad tech companies it picked up. Robert points out that Viant’s customer database will undoubtedly be appended to Time’s massive database to better target digital ads. He also makes an intriguing prediction about the future of this once-thriving music network. What marketers need to know about Twitter’s new algorithmic catch-up feed (14:26): Twitter recently announced that it will start giving people the option to have the social network algorithmically curate their feeds to show them the top tweets they may have missed since the last time they checked Twitter – very similar to the way in which Facebook’s algorithm works. This also promises to make the popular social network a more effective ad platform. I predict that if this experiment is successful, Twitter will go “full Facebook” within the next six months. Content marketing surged 35% – while engagement dropped 17% (20:03): A new report from digital marketing solutions provider TrackMaven reveals that brands increased their content marketing output by 35% per channel in 2015, while engagement dropped 17%. Robert and I agree that most marketers are producing so much content today that quality inevitably suffers. That, in turn, results in less engagement. We also theorize that two channels that most people no longer use for social engagement could be skewing TrackMaven’s numbers. Getting ready for the tech slowdown (28:24): A slowdown in the flow of venture capital money, a bumpy IPO market, and grim outlooks from publicly-traded tech giants suggest that the boom times in Silicon Valley are coming to an end, reports PR Week. Experts say this will force new PR approaches for many enterprises and cutbacks on marcom spending in this sector. Robert and I continue to believe that 2016 will be a year of consolidation for marketing and ad technology firms. AdStation: One of the biggest questions we get, and one of the biggest challenges to content marketers is: How can I safely monetize my content? In other words, how can I safely insert targeted, branded advertising into my mailings, without driving any users away? 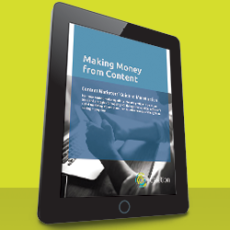 To answer this question, AdStation has created an e-book on content monetization that lays out exactly how to dramatically increase your revenue per user, without any attrition. You can download it here. Joe’s raves: I have two raves to share this week: Netflix recently set up a faux campaign headquarters for House of Cards’ Frank Underwood, to coincide with the recent Republican debate in Greenville, South Carolina. I think this is a brilliant way to promote the show. My second rave is for the amazing “space tourism” posters that NASA’s Jet Propulsion Lab is giving away. They’re fantastic! You can download them for free, or purchase postcards and posters of this beautiful artwork. This is a great way to build support for NASA’s mission. Robert’s rave: Robert loves Chad Pollitt’s article on the macroeconomics of native advertising. Pollitt provides a detailed analysis of evolving consumer needs and content marketing, and he explains why native advertising has become so important today. 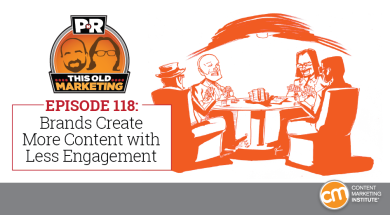 Robert believes many companies are struggling to get the attention of their target audiences because they treat content as a cheap commodity. They produce large volumes of it with little regard for its quality. No wonder customers aren’t engaging with it! Fat, Sick and Nearly Dead & Breville: An Australian businessman named Joe Cross was significantly overweight. He decided to lose weight by taking a 60-day trip across America using juicing as his only source of food. As he traveled, he shot a video documentary of his progress. When his film, titled Fat, Sick & Nearly Dead, hit Netflix, it went viral. That resulted in a spike in web searches for keywords related to juicing. In addition, juicer manufacturers saw a big spike in demand for their products. Two years after the film was released, Breville, an Australian manufacturer of juicers, reached out to Cross to form a partnership. It offered to support his efforts to create content about healthy living, but didn’t put any restrictions on him. Cross has since produced a second film about healthy living and juicing. What can brands learn from his experience? Don’t be afraid to reach out to key influencers in your niche and form partnerships with them. Chances are, they have some amazing stories to tell. Fat, Sick & Nearly Dead is an excellent example of #ThisOldMarketing.